Prisoners on Friday called for the Officer-in-Charge of the Georgetown Prison, Superintendent Kevin Pilgrim to be fired, saying that he must be dealt with because he allegedly had a hand in the death of their fellow inmates. Calm has since been restored to the Georgetown Prison following a meeting between a delegation of prisoners and Minister of Public Security, Khemraj Ramjattan and Minister of State, Joseph Harmon. Some of the inmates speaking through from the prison yard vented their frustration with prison officials while demanding a meeting with Government Ministers. Regan “Grey Boy” Rodrigues, one of the rioting prisoners stated plainly that the officials threw tear gas into the fire. Rodrigues is currently on trial for the assassination of political activist Courtney Crum-Ewing in April, 2015. “I rather carry this building with me…The whole f**k**g jail gotta break up,” said Rodrigues. The Prisoners also shouted that one of the dead prisoners was shot and pushed back into the fire to perish. A total of 17 prisoners have been killed and 12 injured, according to information last released by officials. An inmate leaving the Georgetown Prison. As the morning continued, a barrage of loud explosions and gunshots were heard coming from the prison compound as joint services attempted to subdue the prisoners. Prisoners could be heard shouting and banging objects against their prison cells. They also kicked out an already weakened section of the southern and northern walls of the prison. 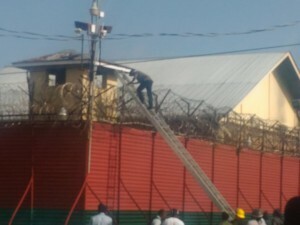 The prisoners, with their guile, managed to set fire to another structure in the compound and equipped themselves with a saw which they used to saw through structures. 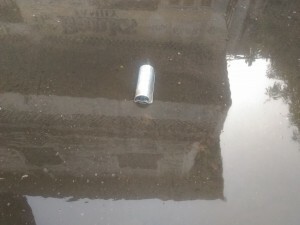 A teargas canister in the vicinity of the Georgetown Prison. This led to rescue attempts being mounted to save a prison warden from one of the observation towers since he was unarmed and could not defend himself. As officers in the compound continue to close in on the prisoners and fire tear gas in their direction, prisoners took the canisters and lobbed them over the prison fence. The canisters dropped in the vicinity of several joint services’ ranks who were without protective gear and they rushed away for safety. Hours later after the situation had subsided, six prisoners were rushed to the Georgetown Hospital nursing various injuries. 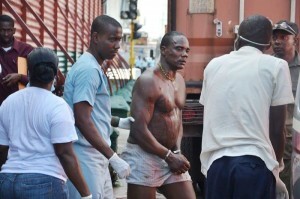 A prisoner leaving for the Georgetown Public Hospital Corporation. One prison officer was also reportedly rushed to the Hospital. Meanwhile, President David Granger has described the situation as the “worst” prison riot in Guyana’s history and has announced that the families of those killed in the rioting would receive some amount of compensation. 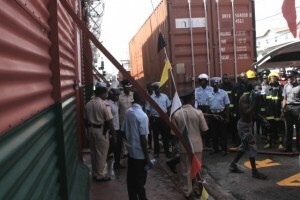 “This is certainly the worst prison riot we have had in Guyana, but we never expected any disturbance in the prison would degenerate to what we’ve seen over the last couple of days…The families could be assured that the government is aware of the plight they might be facing at this time and we will do our best to relieve their discomfort,” said President Granger. A Board of Inquiry is expected to be convened within the next week to address the issue.